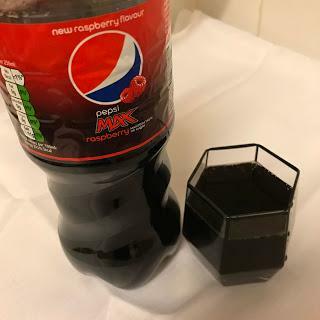 Pepsi Max Raspberry New for the UK! It wasn't easy to get one of these. I first had to go through a few rounds of messaging Tesco's customer support to find out if there was any stock...then when I went to Tesco there was none on shelf...and eventually, after asking a member of staff who tried to fob me off and then went to look for me...I had one! After all that effort, I was hoping it'd be worth it! The ingredients are pretty much the same as any Pepsi Max, an array of flavourings and sweeteners, but whatever. I popped the bottle in the fridge and waited for it to become nice and chilled. Using my fancy Root 7 glass ( available here for anyone interested) I poured some out to try. It has that unmistakable fizziness of Pepsi Max, that is somehow better than Coca Cola in my opinion. The taste is... well first I was hit with the regular Pepsi taste, very strong, full on and better than Cocoa Cola. I can see why they call it "Max" because despite there being no sugar you wouldn't think so - there's no strong artificial sweetener taste like you get with Diet Coke. The raspberry is pleasant, fruity and fairly subtle but not too shy either. In other words it's "just right". I think this one is actually better than the Coca Cola Raspberry, simply because I prefer Pepsi Max in general. The mix of raspberry and stronger cola flavour blends well. Does it outshine Pepsi Max Cherry though? Not really - nothing can beat such a classic flavour - but it's certainly pretty great in its own right.